INTRODUCTION: Compression-flexion injuries of the cervical spine often result in instability of both the anterior and posterior columns. Debate exists in the literature regarding the surgical approach to stabilisation of these fractures, the options being anterior, posterior or combined surgical approaches. The combined approach offers superior stability, but results in increased cost, patient morbidity and theatre time. This study reviews the results of the anterior approach with standalone cervical corpectomy and plate stabilisation combined with postoperative Philadelphia collar immobilisation. METHODS: We retrospectively reviewed 30 patients with compression-flexion injuries of the cervical spine. Surgical management consisted of anterior corpectomy, iliac tricortical strut autograft, and anterior cervical static locked plating. Postoperatively patients were immobilised in a Philadelphia collar for six weeks. This radiological review assessed the postoperative constructs, and the final follow-up radiographs. 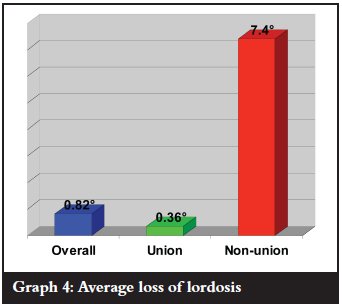 RESULTS: Overall radiological union was achieved in 90% of cases at an average of 3.8 months. Patients with good constructs had a union rate of 100%. Those with poor constructs had a 25% union rate. Poor results included delayed union, cervical kyphosis, graft migration and loss of screw fixation. CONCLUSION: Poor results in this study were related to operative technique. With good operative technique, excellent results can be expected. 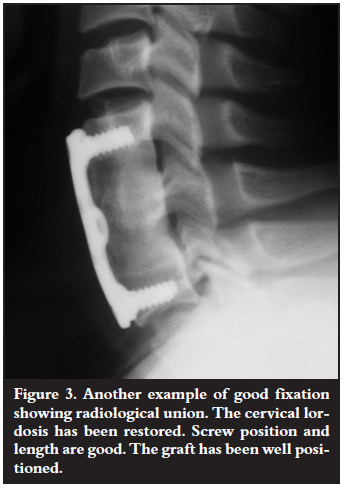 Therefore, anterior cervical corpectomy and locked plating alone, with Philadelphia collar immobilisation, appears to be a safe and cost-effective alternative in the management of these fractures. Compression-flexion injuries are most commonly caused by motor vehicle accidents and diving injuries.3 They are divided into five stages with increasing severity for each stage. The injury is speculated to occur first by flexion of the spine through the facet joints. The anterior column (vertebral body) becomes increasingly compressed and shortened. Eventually, the posterior ligamentous complex fails, noted by interspinous gapping and local kyphosis. With further energy, the facet joints will fail, leading to translational deformity.4 Therefore with mild injuries only the anterior column is injured, but with more severe injuries the posterior column is disrupted as well. 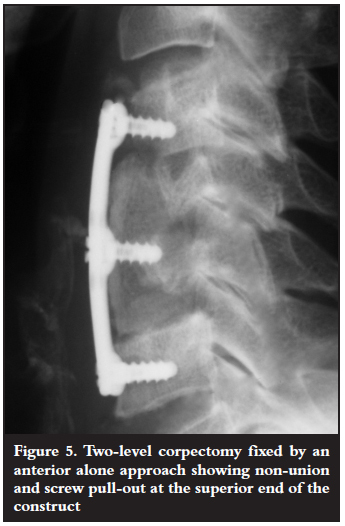 The advent of locked plate technology has increased the strength and stability of plate osteosynthesis.11 This now lends itself to the possibility of anterior alone plate fixation with postoperative immobilisation in a cervical orthosis.12 The rationale behind this is that locked plate fixation of the anterior column is sufficient enough to avoid having to augment the posterior column surgically, and simple immobilisation in a Philadelphia collar is adequate. This study was performed to assess the results of this technique as it is an attractive option, especially in units with limited theatre time and budget constraints. This was a retrospective radiological review. We reviewed 30 patients with compression-flexion injuries of the subaxial cervical spine who presented to Groote Schuur hospital over a five-year period. There were 24 males and six females in the study group with an average age of 26 years. All patients presented initially to Groote Schuur hospital's trauma unit, either from referral hospitals or from Groote Schuur's drainage area. There they were stabilised and initially immobilised with cones callipers and traction. All patients had cervical spine X-rays and an MRI scan. Patients were operated on at the next available theatre list. The surgical procedure was an anterior corpectomy, decompression and fusion via a Smith-Robinson anterior approach. 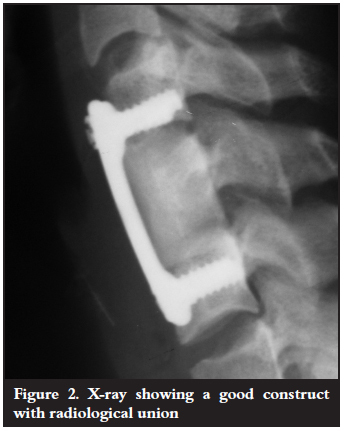 The plate used was a CSLP (cervical spine locking plate) - all cases done used a plate from the same company. The graft was an iliac crest tricortical strut autograft, harvested with osteotomes or an oscillating saw. A screw was inserted in the graft depending on the surgeon's preference. Patients were immobilised in a Philadelphia collar for 6 weeks postoperatively. A variety of surgeons were involved including consultant orthopaedic and neurosurgeons, as well as spinal fellows. We defined the surgical technique as either adequate or sub-optimal fixation. On the initial post-op radiographs the quality of the construct was assessed by the abovementioned means, and was classified as either adequate or sub-optimal. The postop and final follow-up radiographs were then assessed and compared. 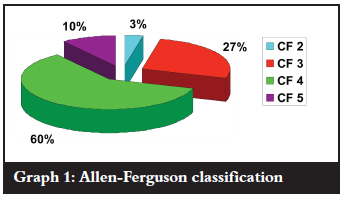 This suggests that injury severity by Allen-Ferguson classification does not affect union rates. These union rates are similar to the overall union rate. The principal goals in the surgical treatment of cervical spine injuries are: stabilisation of the spine, decompression of the spinal cord and facilitation of rehabilitation.15 With compression-flexion injuries of the sub-axial cervical spine, decompression should be performed anteriorly via a corpectomy to increase the chance of neurological recovery.16 Stabilisation is obtained by fusion to adjacent vertebrae, and can be done via either an anterior or posterior approach. 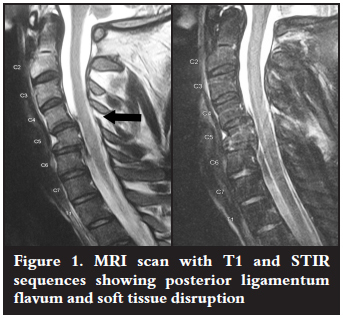 Compression-flexion injuries of the cervical spine causing spinal cord injury are usually associated with disruption of the posterior bony and/or ligamentous structures. This is supported by the findings of this study. This therefore raises the question of whether anterior plate stabilisation alone is biomechanically stable enough to treat these fractures. Several investigators have conducted biomechanical studies of the surgical construct stability provided by various anterior and posterior instrumentations of the cervical spine.21,23-25 Broadly speaking the options are anterior alone, posterior alone, or a combined stabilisation approach. It has been concluded by many of these studies that combined anterior and posterior fixation, and a posterior alone fixation, are both biomechanically more stable than an anterior alone fixation.23,26,27 Although posterior stabilisation alone provides adequate stability, there is inadequate decompression anteriorly via a corpectomy, especially when there is canal compromise, so this technique is not favoured by surgeons.16 Therefore this leaves two options: anterior alone stabilisation or a combined approach. 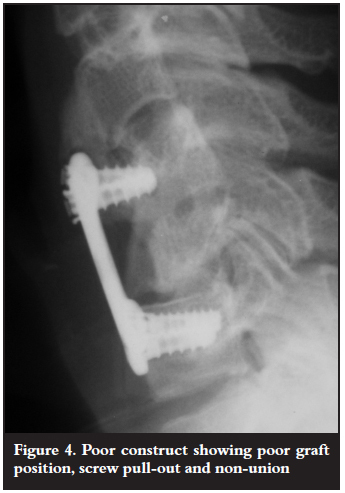 Some studies have suggested that anterior plate fixation alone was insufficient when posterior structures were injured.24,25 There have been no studies though, to assess the success of the technique of anterior alone locked plate stabilisation after single level corpectomy, with postoperative immobilisation in a rigid cervical collar. The theory behind this is that the increased stability afforded by locked plates, combined with immobilisation in a rigid cervical collar, obviates the need for posterior stabilisation. As mentioned in the introduction, a combined anterior and posterior approach is associated with increased complications and prolonged operative time. If an anterior alone approach shows acceptable results then it would be an attractive option due to the shorter theatre time required, reduced cost and patient morbidity. If there is more than one vertebral body involved and the procedure requires a two-level corpectomy, results are not as encouraging. There are reports in the literature that show a high rate of failure with anterior instrumentation alone in these cases.29 In our study, out of the three patients who did not unite, one of them was a two-level corpectomy (Figure 5). In these cases then it is probably advisable to supplement the anterior fixation with posterior instrumentation as well. Patients in this study were only followed up until radiological union. Therefore the follow-up is too short to comment on any adjacent level degeneration. All poor results in this study were due to sub-optimal fixation. Those constructs showed a 25% union rate (1 out of 4). All patients who had adequate fixation united (26 out of 26). Therefore with good surgical technique 100% union can be expected. There was no correlation between posterior ligament rupture and union rates. Therefore, it appears that supplementing the anterior fixation with posterior instrumentation is unnecessary. In cases where multi-level corpectomy is required, posterior supplementary fixation is recommended. We can therefore conclude that anterior cervical corpectomy and locked plating alone with Philadelphia collar immobilisation appears to be a safe, cost-effective and time-saving alternative in the management of compression-flexion fractures in the sub-axial cervical spine. No benefits of any form have been received from a commercial party related directly or indirectly to the subject of this article. The work in this article has been approved by an ethics committee.